When the weather forecast is for more snow (3 to 5 inches in the New York-New Jersey area today) and it's erev Shabbat, our thoughts turn to.....chicken soup with matzo balls. The internet and printed recipe books are overflowing with recipes for the real stuff, as made by bubbes worldwide and by gourmet chefs. 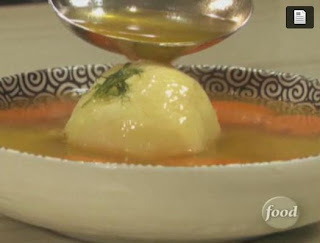 Bobby Flay, Food Network chef and host of Throwdown, challenged Jeff Nathan, one of the most popular kosher chefs and owner of Abigael's Restaurant in New York City, to a chicken matzo ball soup competition. The mission: Create a chicken matzo ball soup with a twist that even the most discerning Jewish grandma would be proud of. So choose your sides and place your bets. Which chef will emerge the winner? Enjoy the video and have a Shabbat Shalom!